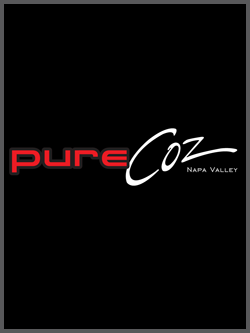 pureCoz is moderately rich and intense and complex proprietary red wine blend with warm and well integrated tannins. It exhibits intriguing aromatics of clove, currants and a hint of Black rose. A well structured wine of elegance and depth showing broadness across the palate. Boysenberry pie flavors with hints of plums, cherry and spice that finishes refined and polished. Stylistically it shows familiar elements of Meritage and Super Tuscan wines. Punched cap fermented following de-stemming. Each lot aged in French Oak barrels 39 months prior to blending, then bottled. This wine since its inception was designed to be more versatile when it comes to food matchups as Meritage wines tend to be. It also includes the rarest of Cabernet Sauvignon clones in this Country, which is the Secret Clone, which migrated from Italy. This is the second pureCoz with Petit Verdot included in the blend. This vintage has already gathered notice by winning awards in its first competitions prior to release.